Roland, a repeat customer of BsnTech Networks, contacted us a couple of weeks back asking about another website design he requested. 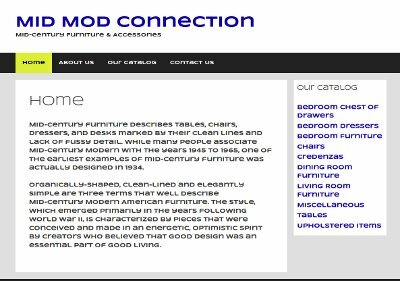 Roland owns a business, called Mid-Mod Connection, where they sell mid-century furniture and accessories. Roland was looking for a very simple, clean website that he could use to provide online visitors a showroom of his inventory. He did not want any eCommerce capabilities, but just the ability for visitors to see the items available, several pictures, the description, and the asking price. Once we received the information from Roland, we started on the website within a few days. Just this evening, we had our final phone call to complete the website design and make some minor modifications to fit their style. Roland is now empowered to go and add and manage his inventory on the site with the use of our easy to follow video tutorials that will keep him on track. We appreciate the continued support and business from Roland! The Mid-Mod Connection website is at midmodconnection.com. Lisa, the owner of Health Information Management Solutions, contacted us a couple weeks ago to have a website designed. During that process, she also decided that she needed help with creating a professional logo for her business. We sent over the order to our graphic designer and they got started right away. After Lisa supplied some ideas for her logo, a few different mock-up designs were sent to Lisa for her review. Lisa was very pleased with the service and the turn-around time from our graphic designer and was happy with the outcome. BsnTech is still finishing up some final items on her website – and then her website will be ready to showcase as well! Matt contacted us last week about his websites. Originally, he had one website that was hosted with another provider – and another website that had recently been shut off. He wanted us to see about transferring one website from the other hosting provider (he was paying $60 a month for hosting with them) and then have us create a new website for his other service – The Taxi Guy. Matt was able to get in touch with the previous web designer of The Taxi Guy website and they got the website online for him. But, our web hosting was still lower cost so he wanted us to grab the site and make a copy of it – then transfer it to our servers. BsnTech Networks provides this service to a few customers on a yearly basis. Once his website was back up, we were able to make a copy of it. It then took about an hour to modify some of the structure of the site. We then copied it to our servers, changed the nameservers on his domain name, and he is fully up and running on our redundant website hosting platform! We appreciate the business from Matt. We are still waiting for the other site – since he is needing to get the domain name from his other provider before we can proceed with moving the hosting for his other business. 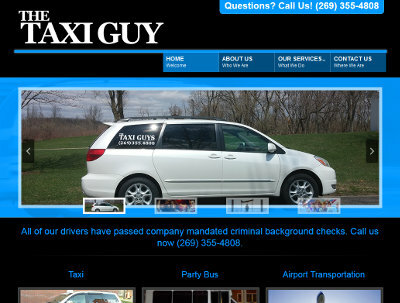 The Taxi Guy website is at thetaxiguy.net. Jason, the owner of Affordable Animal Control, contacted us several months ago about getting a website started. At that time, Jason was very busy and didn’t have the opportunity to get us any information until just recently. In the past week, Jason sent us the info he wanted to have on the website. In addition, he asked us to create a professional logo for his business as well. Both his website and the logo design was done within a week – and he has approved of both of them. Next, he is wanting us to help with advertising for his business. He has elected to have us setup a Google Places page and do some pay per click advertising for him. We appreciate the business from Jason! The Affordable Animal Control website is at affordableanimalcontrolwis.com. 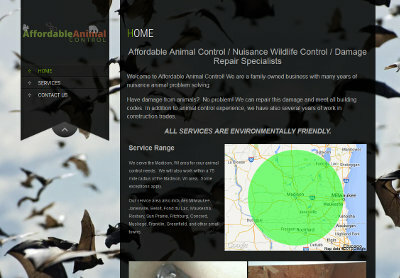 Jason, the owner of Affordable Animal Control in Wisconsin, had us create a website for his business. During that time, he decided that a professional logo design was also needed. He wanted to ensure he had a brand and a symbol that would help customers recognize his business. Our graphic designer turned around the logo the same day! He sent over the first mock-up design to Jason. After a few modifications later, the logo was fully completed within a week’s period of time. We appreciate the continued business from Jason! 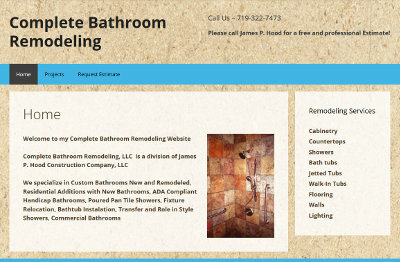 James contacted us in order to have a new website created for his bathroom remodeling business. Several months ago, James had us create a website for him to showcase his work. Since then, he has continued to grow and wanted to have a separate website to showcase the bathroom services. James sent over the information that he wanted on his website very quickly – and we had the new site done in just two days after a couple of changes were made. Later on, some updates will be done to his original website to modify it to focus on home building and renovation. James’ new website is at completebathroomremodeling.com. Kevin, a continuous customer of BsnTech, had us create the fourth website for him. For this website, he had another consulting business website that needed to be created. He also created this site using the WIX platform and asked us to duplicate it – within his budget. This site was a complex site that looked very professional. A total of six pages, drop-down menus, a contact form, mobile device compatibility, and generally a very professional and detailed website was on our plate to complete. Once we had the ability to start on it, it was completed in three days. Kevin notes that he still has at least three other websites that he needs us to complete as well. The new consulting service website that we created is at agiconsulting.us. 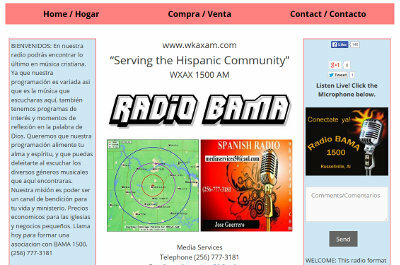 Jose from WKAX AM 1500 contacted us last week needing to get a website setup for his small radio station. He wishes to spread awareness of the station and allow the ability for listeners to go to the site and submit comments to him – or listen live from the site. Jose sent us a PDF file of how he wanted the website to look. After a couple of modifications to that file, the site looks identical to the files that he sent us. He was very pleased with the attention to detail and the turn-around time that we provided him to get his website online. Later one, Jose plans to add a classified ad section to the site to allow listeners and the general public to post classified ads on the site. This will be a second phase of the project down the road. The website for WKAX AM is at wkaxam.com. Lynn contacted us about a week ago on behalf of her husband, Ron. 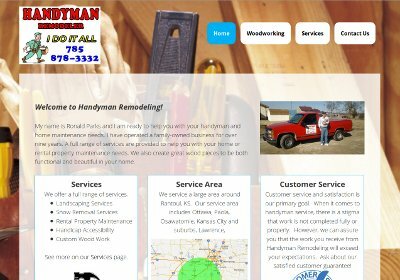 Ron owns and operates a handyman business that serves Rantoul, KS and surrounding areas. Lynn said that they needed to get a basic website up and running to help advertise for their services. Upon getting the details that they wanted on the site, BsnTech worked right away to get a site going. Within less than 24 hours after they made the initial payment, we already had the majority of the website done. Lynn then requested that we add a fourth page to the site to showcase her husband’s woodworking skills. He makes custom wood crafts that are decorative and functional that include coat hangers, fireplace mantles, showcase cabinets, custom entertainment center cabinets, and more. We appreciate the busuiness from Lynn and Ron! The Handyman Remodeling website is at handymanremodeler.com. This video tutorial covers the necessities to manage simple products on your website made with WordPress. This video tutorial will explain how to add products, edit products, delete products, add a featured image (the main image that appears in the product listing), add additional images, set pricing, and adding to categories.